*The packaging states the rear sight is windage-adjustable only. That is incorrect. **The dovetails above and below the barrel are not standard measurements. 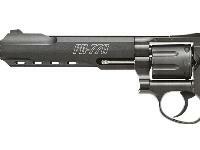 They measure 7.84mm (above the barrel) and 7.93mm (under the muzzle). The standard airgun dovetail is 9mm (3/8") to 11mm. Learn more about the Gamo PR-776 in Dennis Adler's Airgun Experience Blog. Swing out the cylinder and pop in a preloaded circular clip. Close it up and start shooting! 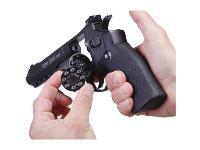 This 8-shot pellet repeater has a real revolver mechanism, and single- and double-action. 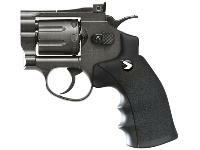 Powered by a CO2 cartridge, the Gamo PR-776 has a 6" rifled steel barrel. The molded, stippled grips have finger grooves for added control. Extremely realistic. Tom's testing indicates you can get about 70 shots per 12-gram CO2 cartridge. Things I liked: Mostly metal constuction, well finished, feels good in my hand, good shot count per co2 cartridge. Accuracy is a mixed bag, shots were well grouped but consistently high. Sights could not be adjusted enough to bring them down. Things I would have changed: About a month after the warranty expired the gun began to leak co2. Gamo does not sell replacement parts but will repair for a fee. When added to shipping cost total was more than half the cost of the gun. 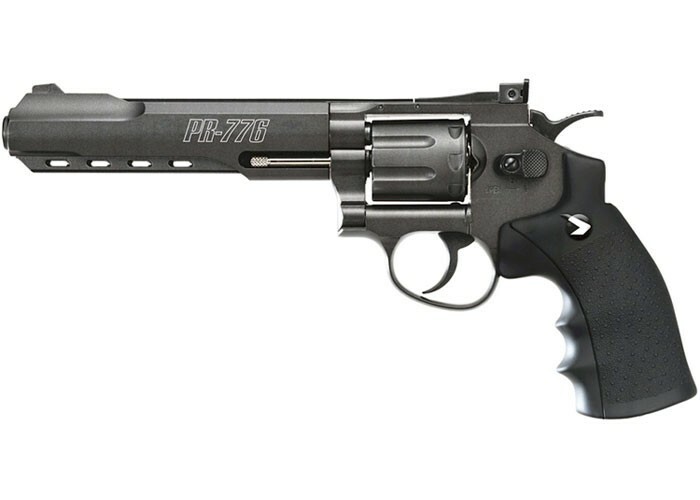 I found a good deal on a new one, so I bought a new PR776. Sure enough, about a month after the warranty expiration the new gun began to leak. Enough for me, once could be a fluke but twice is a pattern. What others should know: Don't buy this unless you are prepared to repair or replace every few months. Buy guns from a manufacturer who will sell repair parts. Things I liked: Great service from Pyramyd Air. 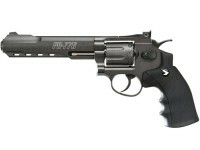 Things I would have changed: Should not have ordered this pistol. Things I liked: this gun is rock solid! the action is smooth. metal clips. about 60 rounds per co2 cartridge. Things I would have changed: only the plastic grip. seems flimsy. What others should know: for a non scope pistol -its a winner. Will the h&n baricuda hunter 10.34g jam in it? Is it possible to mount a sight on this gun even without a rail? It looks like some people were able to in the customer images. Why no top rail. Unable to mount red dot or scope..?,, MAJOR BLUNDER on behalf of the PR-776's designers.